Joyoshare Screen Recorder for Windows was newly launched to record any screen video with audio simultaneously on computer with high quality. Hong Kong, Jan. 05, 2018 - Joyoshare Software officially announced the release of its Screen Recorder for Windows, aiming to help computer users easily record anything, including all desktop activities, screen video, system sound, streaming music, online movies, games, Skype chats, webcam videos, webinars, lectures, podcasts, etc. on PC. As a simple-to-use screen recording program, Joyoshare Screen Recorder for Windows comes with a clear UI so that everyone can record the computer screen with ease. Thanks to this full-featured video capture which makes screen recording much easier and more professional, users can record any area on computer screen, grab online movies, make video tutorials, capture games, take screenshots, etc. at anytime on Windows 10/8/7/Vista/XP. Being a powerful screen video recorder, Joyoshare Screen Recorder supports recording all types of computer videos, including self-demonstration, lectures, live chat, webinars, podcasts, video games, streaming movies, Skype calls, webcams, etc. either in full screen, customized screen size or preset fixed resolutions like 320x240, 640x480, 1280x720, etc. The default output format of recorded video by Joyoshare is standard MP4. It also allows users to save the screen recordings as AVI, FLV, SWF, WMV and other popular formats without quality loss. In addition, it supports most commonly used mobile devices like Apple iPhone, Android, smart TVs, game consoles, etc. so that users can easily share the recordings to others on any platform. When recording videos, users can also record system and microphone sound at the same time or not. 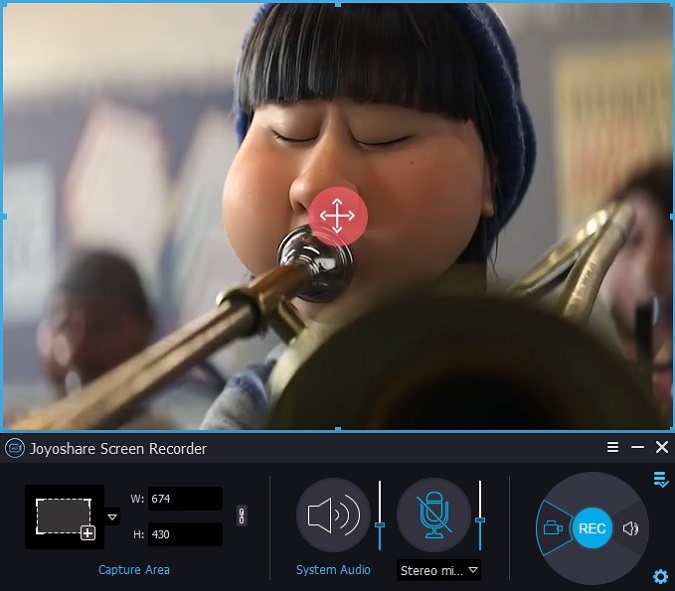 Aside from a video capturing tool, Joyoshare Screen Recorder can also serve as a smart independent audio recorder to capture sound only without video. As an audio capture, it's able to record system sound, microphone voice, streaming music, online radio, music games, and any other sound play on PC while converting the captured tracks to MP3, AAC, WAV, FLAC, M4A and M4B. The new release of Joyoshare Screen Recorder also introduces other stunning features for screen recording, including allowing users take screencasts while recording, set scheduled recording tasks, create easy shortcuts, and highlight cursor and click effects, etc. All these additional functions help to record more personalized videos and audios. "The biggest advantage that makes Joyoshare Screen Recorder stands out from other screen recording software is its ease of use and high performance. Unlike other screen recorders that introduce redundant buttons and complicated UI, Joyoshare Screen Recorder makes high-quality screen recording as easy as 1-2-3 due to its better designed clean interface. Besides, it provides more output formats and devices to store those recordings than any other rival products. It's a perfect screen recording program for both beginners and professionals." said Dave, the marketing director of Joyoshare. Joyoshare Screen Recorder is normally priced at $29.95 for a single license copy with lifetime free tech support and software update. There are other license types available as well, including $59.95 for 2-5 PCs with lifetime free update and support, and $79.95 for unlimited use. Currently, this well designed screen recorder is available for Windows OS only while the Mac edition is being developed and will be released soon in the near future. Joyoshare is a world-leading multimedia software developer and provider specialized in video field for years. With advanced technologies and professional R&D team, Joyoshare is dedicated in developing the best video and audio solutions, including video converter, audio converter, video editor, media cutter, HEIC converter, screen recorder, iOS solutions, etc. to customers all around the world. With professional and high quality service, Joyoshare has won high reputation from millions of registered users from the past years.